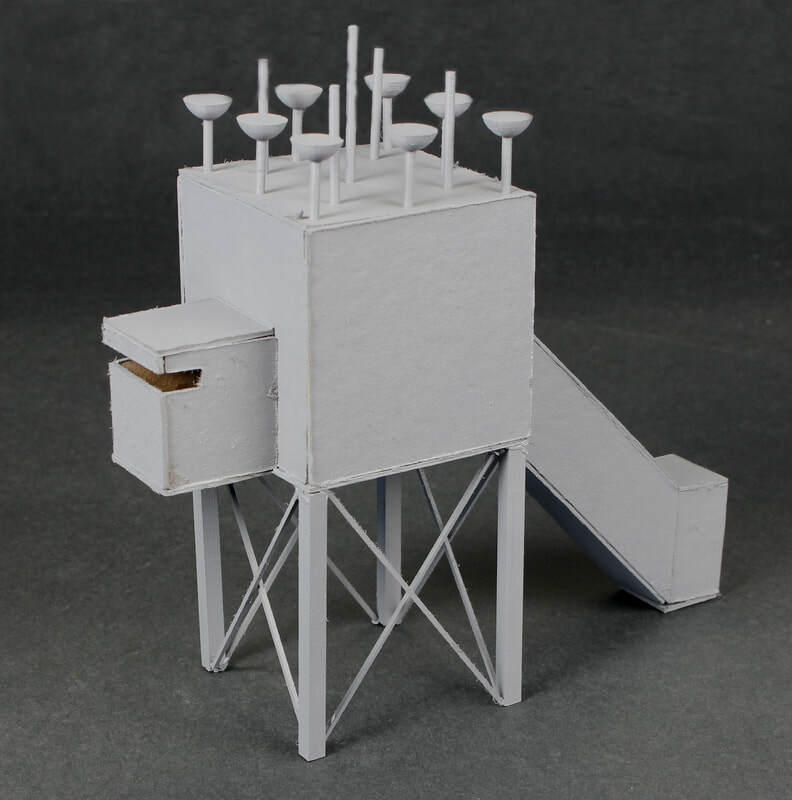 In this project we were given an incomplete building by John Hejduk. With only a few sketches and a description, we were told to complete it. I was given the Widow's House from John Hejduk's Lancaster Hanover Masque town. I was given a sketch of a small square building that was elevated with funnels on the top and another small square room on the front. In the description, I was told that the house provided a Wailing Room. After developing our ideas we completed the project with a final drawing and a model. 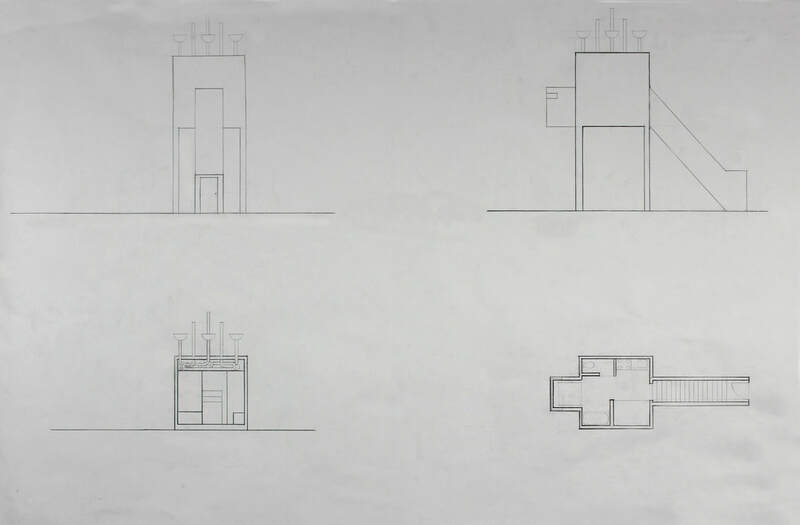 In the final drawing there is two elevations (top), a section plan and floor plan (bottom). In this project we are developing a city within the DMZ that would help unite North and South Korea. Practicum gave us a site on the DMZ and also a zoning map, and we were told to come up with a road map. After the main road map was done, we further develop the road map within each zones. Each one of us were given a zone, I was given the residential zone. In the residential zone I decided not to have as many roads because not a lot of people drive in Korean. Instead I added big sidewalks that would separate the houses. I would still have roads every third street, so people that do drive can drive within the zone. Another part of the project was to individually design a building within our zone. I chose to design a single family house. I created three concept designs and also study models for each design. My first design was a courtyard type of house; where different rooms would be a separate buildings. My second design was a traditional "U" shaped building with a patio within the "U". My third design I did part of the wall curved, so that it could give them a outdoor area along the curve. I decided to further develop the courtyard house. I separated the rooms into three buildings; an entertainment space and two bedrooms. In the entertainment space there is a living room, kitchen, dining room, laundry room, storage, and a half bath room. It is called the entertainment space because that is where you would entertain guest. The two bedrooms both have a bathroom and a bedroom; in the parents (left) there is a closet, and for the kids (right) there is a play area. What also makes the kids bedroom different is the glass wall in the play area. Along the curved part of the building there is three glass walls to make the curve. Here are my final plans and models of my courtyard house. In the left slideshow I have my floor plan, site plan, elevations, sections, and some renderings. In the right slideshow you have pictures of my final model.